A tropical tall tree with fragrant blossoms which can produce up to 2000 nuts per year. Nutmeg is the stone of the fruit. The husk covering the seed when ground is known as mace. Used in commercial cough and decongestion preparations and in pain relieving ointments. A drop or two of nutmeg oil on a cotton swab is said to help with relief of toothache. It is also said to help with digestive system disorders. Brought by arab traders to Constantinople in the 6th century and then by the 12th century brought back to Europe by the crusaders from the Holy Land. In Elizabethan times it was believed tho ward off the plague and also used in perfumes and oils. 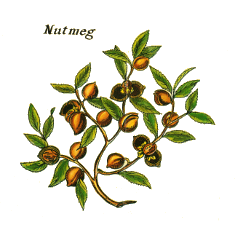 At the height of its value in Europe nutmeg was carried by the upper classes as a demonstration of wealth. Diners would carry thier own tiny graters and nutmeg to use in restaurenats. It became at this time the most expensive spice in the world.